1- What is a bioplastic ? 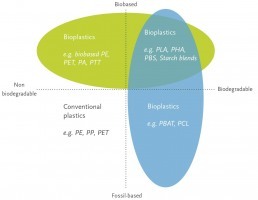 Many designations are used to designate the field of bioplastics: biopolymers, bioresins, biomaterials. It seems that the word bioplastic is becoming more prevalent. 2- What does "bio-based" mean ? The most common and the most recognized one is the carbon-14 (EU: CEN / TS 16137, USA: ASTM 6866). The percentage of renewable carbon is related to the mass of non-renewable carbon (by dating both carbons). This method has led to the creation of labels (see Vincotte and DIN CERTO) enjoying a good reputation. Meanwhile, ACDV (Association Chimie Du Végétal) proposes a method that takes into account the mass of the renewable material on the total mass of the material. This method is complementary to the first one ; it considers, in addition to carbon, the chemical elements such as oxygen, nitrogen and hydrogen. 3- What is PLA ? The PolyLactic Acid (PLA) is a biobased biopolymer being today mainly produced in the United States from corn. Sugar is derived from cornstarch which, after fermentation, produces lactic acid. PLA is then obtained by chemical synthesis of this acid. New research has led to a new sourcing of raw material for PLA production at an industrial scale: sugarcane. 4- Why do we mainly use corn for PLA production ? The largest producer in the United States mobilized corn since it is a local resource, adapted to the pedo-climatic environment, and offering the best compromise between performance, cost and efficiency of the supply chain. 5- Is the corn used GMO? PLA production does not require the use of a single variety of corn. PLA production does not specifically require GMO corn (see NatureWorks FAQ). For European customers who require it, NatureWorks is committed to only supply non-GMO corn for quantities corresponding to their needs. European orders therefore generate no additional sowing of GMO corn. 6- Does PLA contain GMO ? No, the manufacture of PLA requires multiple synthetic steps and only the chemical structure is preserved and biological structures likely to be GMO are destroyed. So there is no trace of GMOs in the PLA material. 7- Do we know culture methods for PLA production ? We require from our suppliers that corn cultures are all certified by the International Sustainability & Carbon Certification (ISCC) label which guarantees framework respectful of environmental, social and economic conditions in which cultures are conducted. 8- Using corn for bioplastics production : does it not compete with food uses ? World corn production in 2012 was close to 820 million tons, of which more than 300 million for the United States alone. According to the European Bioplastics (2011 report), world bioplastics production capacity would average 1 million tons mobilizing about 5 million tons of corn or 0.6% of the resources. 500,000 ha out of an Useful Agricultural Area (UAA) of 1.4 billion ha are used for bioplastics, which represents only 0.03% of cultivated areas. In Europe, not more than 75 000 ha should be mobilized to match the amount of bioplastics marketed in this area (between 100 and 150 000 tons) which is equivalent to less than 0.05% of the European UAA (EU = 27 countries). 9- Is PLA biodegradable ? PLA is biodegradable in the sense of EN 13432 standard, that is to say that it is industrially compostable. Indeed, in order to degrade, PLA requires a minimum temperature of 58°C and high humidity. Under these conditions, PLA biodegrades in a few weeks without generating toxic residues. The compost can be used as a substrate for agriculture and horticulture. 10- What are the environmental benefits of bioplastics such as PLA ? Regarding environmental impacts, PLA is much more efficient than a conventional (petrochemical) plastics, especially on criteria such as greenhouse gas emissions and consumption of non-renewable energy.